Bearing sensors: The Rolfes Co. Bulk weigh scale: CompuWeigh Corp.
Conveyors: The GSI Group, Riley Equipment Inc.
Inc., Richard Myers & Son Motors WorldWide Electric Corp.
Kokomo Grain Inc.’s rail terminal in Amboy, IN, which was upgraded extensively in 2003. Photos by Ed Zdrojewski. It was a good idea at the time, but Mother Nature had other plans. 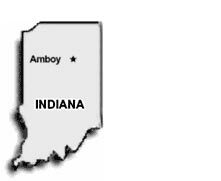 Dry weather that summer resulted in a smallerthan- normal crop in central Indiana. The upgrade involved installing an automation system, boosting leg capacity, installing a higher-capacity bulk weigh loadout scale, and building a new office and truck scale. Kokomo Grain did its own engineering on these upgrades and supplied much of the labor on the $1-million-plus project. B-P Construction, Sheridan, IN (317-758- 6126) served as general contractor on construction work, and Richard Myers & Son, Russiaville, IN (765-883-8177), performed millwright work. Dever Electric, Livermore, KY (270-278-2116) served as electrical and automation contractor. 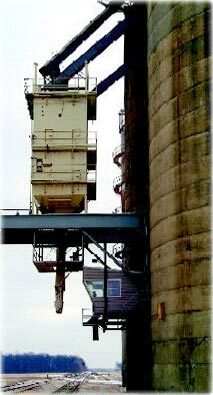 During the course of construction, workers utilized a permanent 15-ton crane Kokomo Grain had installed on the roof of the elevator in 2002. Work was completed in time for the 2003 harvest. Installing a new PLC-based control system incorporating receiving operations and monitoring functions such as grain temperature and bearing temperature. 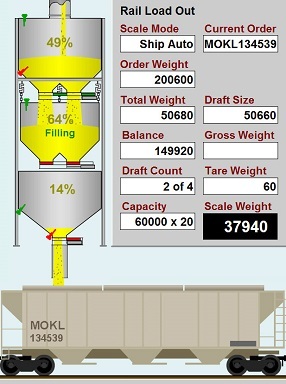 The system tracks bin inventories and automatically routes incoming grain to the appropriate bin via the appropriate equipment. Built a new power room above the grain receiving station to house the motor control center for the new automation system. Replaced two old receiving legs with new 22,500-bph GSI legs, outfitted with 14×8 Tapco HD-CC low profile buckets on a 16-inch Scandura belt. Replaced an old seven-hole distributor with a new Rapat eight-hole double distributor. Replacing the distributor also required the installation of new spouting with Tandem Rhino-Hyde lining at critical wear points. New 60,000-bph CompuWeigh bulk weigh loadout scale allows Kokomo Grain to load 85-car unit trains on the Norfolk Southern. Installed a 40,000-bph GSI enclosed belt conveyor to carry grain to the bulk weigh loadout scale. Replaced an old office building with a new two-story brick structure. The second-story scalehouse allows operators to see down inside of incoming trucks. Ortmann says the old office building was prone to basement flooding. Installed a new 70-foot Brechbuhler B-Tek pitless truck scale with a Gamet truck probe. “We’re still working out a few bugs, but overall, everything is working pretty well”, Ortmann comments. Harvest went more smoothly than we expected.